← Who’s Afraid of a Five Game Match?? Not the Women. 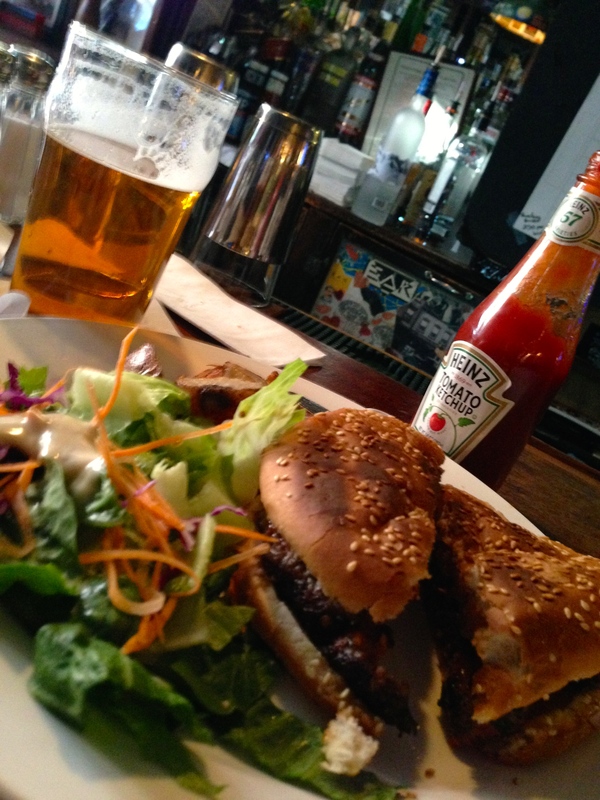 What could be better than a mid-afternoon lunch at one of New York’s oldest bars—the Ear Inn, the Australian Open on the telly, and a cold beer and warm burger in front of you? Not much, trust me. But I was eating late so I could last through two finals at the Tournament of Champions in Grand Central. And I was definitely hoping that they’d give my burger a run for the money. So not to be dry-mouthed during the match, I met a friend for another beer at the ToC bar, and just happened to meet a few of the people at the Women’s Squash Association (Tommy Berden, Ashley Bernhard, and Latasha Khan) who are helping to make this tournament better than ever—getting the top pro women players there, and giving them equal prize money. 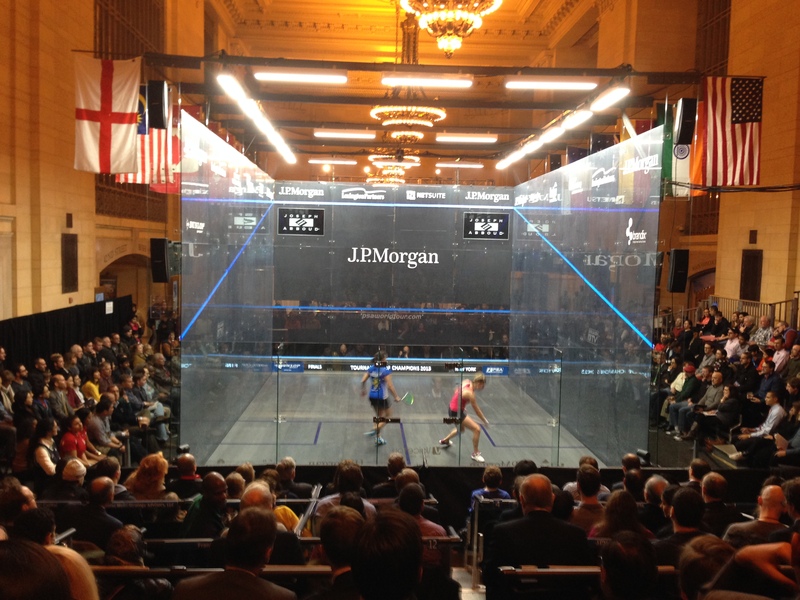 I’ve always been excited to watch pro men’s players on the glass court in Grand Central, but seeing my favorite women on there was truly gratifying. And the last two women standing in this tournament were Alison Waters (ENG, rank 5) and Raneem El Welily (EGY, rank 2). While I’d initially been hoping for a rematch between Nicol David and El Welily (after their neck and neck match at the Women’s World Championship in December), I’d gained a lot of admiration for Alison Waters who took David down in the quarter finals. She was just as tenacious as David, and hit with a powerful confidence one doesn’t always see in women. Plus, her five game match with El Sherbini showed she had many of the same strengths as the volleying and ball-dropping Egyptians. I was eager to see how she’d measure up to El Welily’s superb control of the ball. But that control is a little loose in the first game. El Welily’s balls hit the tin more than their mark, and having watched her now in three matches, I know that more points means more confidence means more drops. More tin means that there’s more of a window for her opponents, and Waters takes it. She wins her points with tight rail drives and a smattering of drops and volleys. El Welily does enough, however, to keep up and it’s not until 9-9 that Waters breaks away again to hammer the next two points home for the first game win, 11-9. The first game is too close, however, to know if Waters is going to sail through a second game. And from where I’m sitting, Waters looks like she’s trying to rest when she can—between points and during let determinations. Instead of coming out strong in the second, Waters misses or tins the ball all the way to 1-5. And despite putting some points together to even it up at 5-5, more of those are Raneem’s errors rather than Waters’ winning shots. She really needs to push the gear higher, as she did so many times with El Sherbini, in order to hold on to her lead in games. To her credit, however, she also keeps El Welily enough off her own game that El Welily gets her points in dribs and drabs. But don’t get me wrong, they both make some absolutely lovely volley drops that seem to cry ‘touché!’ It’s 8-8, 9-9, and then 10-10 and then Waters tins a tough backhand and then, after a breather for a video review, tins a plucky but unlucky volley drop. So now the games are tied at one to one. The two women start off the third much like the second, tinning and bungling balls off the wall, although it’s not as messy as it sounds. Down 3-4, El Welily floats a ball from the back of the court and the balls finds a nick, for 4-4. Sometimes winning a particular point–the way it’s done–can change the player’s psyche, and I wonder if this lovely nick is that kind of turning point for El Welily. Her control and placement of the ball gets more exact, and that forces Waters to work that much harder. But instead of getting every ball back, she begins to miss. Gaining more confidence with every point, El Welily just racks them up, combining her well-placed back corner balls with more gorgeous volley drops. Waters tries, but she ends up losing the game with a stroke point to El Welily. 11-4. This is the problem and the challenge with a final match: fatigue. Everyone faces it, but the harder you work, the harder it is to stay fresh enough for the next match. And Waters really really worked in her semi final match. She needs to do the same here if she’s going to stay in the game. The 4th game starts promising for Waters as she wins the first point and then the third with a tight left wall that El Welily can’t scrape back. But it’s not enough to shake El Welily’s confidence, and she keeps the ball tight, as well. Down 2-4, Waters puts the ball into a back corner where El Welily can’t reach. But El Welily just answers this with another unscrapeable rail. And then, perhaps sensing Waters’ fatigue, El Welily drops and passes and parlays her lead into a bigger one. She gifts Waters a tinned ball for 9-4, but then follows it with lovely, deadly drop for 10-4 and match ball. El Welily corner boasts and it’s done. 11-4. I feel both thrilled and sad at the same time. They both had earned my great admiration. I would’ve felt similarly if Waters had won. But it’s Raneem’s night, and I hope she gets to let it sink in a little. However, when I ask her what she’ll do to celebrate, she confesses that her next tournament starts tomorrow in Greenwich. No rest for this champion. I, however, am going to sleep until Sunday. Sweet dreams, squash mates. 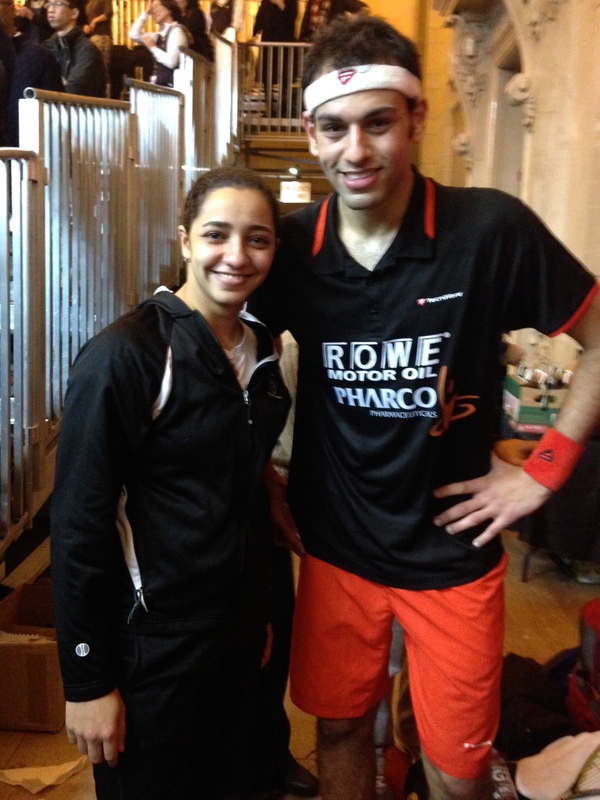 This entry was posted in squash and tagged Alison Waters, Grand Central, Raneem El Welily, Tournament of Champions, WSA. Bookmark the permalink. 2 Responses to What’s better than the best burger in NYC? Victory at the ToC! Whew! Thanks for such colorful, nail-biting reporting!